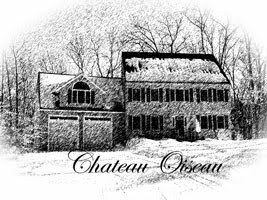 Chateau Oiseau: An Amazing Opportunity...and some bad news! After the tasting, we all went to lunch and chatted about wine. My wife Christine was able to get out of work in time to join us as well. 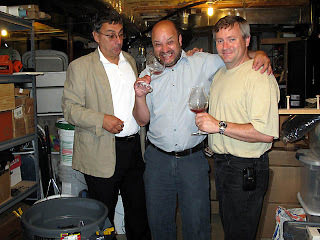 During the conversation I mentioned to Benoit that I am an aspiring winemaker. I told him about my attempts make my own wine. He asked me where I got the grapes and I explained that my most recent batch came from Chile. I don't speak French very well but I did catch something about about "Only in America!!" with a laugh to Pierre. He found the whole thing quite amusing. 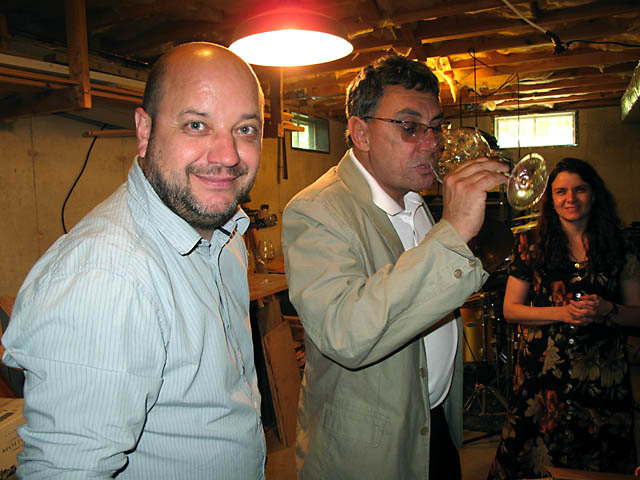 Since he had several hours to kill before he had to be at this next tasting, Pierre convinced him to come up and visit Chateau Oiseau for a couple hours. (He found the name Chateau Oiseau pretty funny too.) Are you kidding me? A top Burgundy winemaker was coming to my house? I was nervous and excited! But how cool is this?? So we drove up to my house. Benoit looked at my vines. They are still so young that he didn't have much to say except that they look pretty good. Then we went to the cellar. He inspected the two fermenters. I could tell he was skeptical of the grapes. He grabbed a glass, dipped it into the must and sampled the pinot noir juice. His eyes lit up and he smiled. "This is good juice! Tastes good!" He was pleasantly surprised--and I was relieved! Next he moved on to the Malbec. He tasted and said "It's a little low on sugar...you will need to add a tiny bit." So we pulled out the hydrometer and measured the brix of each. The pinot noir measured 13.5% potential alcohol--perfect just like Benoit said. (The French use the "potential alcohol" scale for sugar while American winemakers use brix, a measure of the sugar percentage. 13.5% potential alcohol equates to about 24.5 brix.) Next we measured the Malbec and it came in at 12% potential alcohol, about 22 brix. A little low. Damn, the guy was right on--just by taste. He could taste that the must was only 2% low on sugar. OK, I'm impressed! So he gave me some advice on fermentation temperatures and generally approved of what I was doing. His respect for my effort had gone up a click. I was proud! 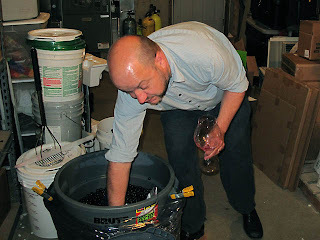 But then we decided to taste the 2009 Pinot Noir I have been working on for 6 months. I used my wine thief to put a little wine from the carboy in a pair of glasses. Immediately, I knew something was not right. The color was too pale. Something had gone wrong. We tasted it. It was not good at all. Since the last racking, it went downhill. "It tastes like the sugar fermentation was not completely finished before the malolactic fermentation started" was Benoit's observation. I was bummed. (I later discovered the cause of the issue: I had accidentally put in two teaspoons of meta instead of 2 grams, so about 5 times too much. It bleached the wine.) Oh well, my first effort is toast. It will have to be discarded because there is no saving it. :-( Benoit suggested in all seriousness that if I distilled it, it would be a good fine (Brandy). Around here I think we would call that moonshine. So after cracking a few jokes at my expense and taking pics of everyone tasting the 2009 and making faces, we headed upstairs for a beer. (A beer made by a brewery that knows what they are doing.) Then it was time to drive Benoit to his next tasting. In the car I got a few more tips and pointers, and a bona fide offer to spend a couple weeks in Burgundy after the harvest in the fall learning wine-making from a master. It probably won't be this fall, but I am definitely going to take him up on that offer at some point! Meanwhile, let's see if Benoit's advice helps me do a little better with the 2010 cuvées than I did with 2009. Anyone have a still I could borrow?